There are a few specific arrhythmias that we encounter often in the ED that deserve a little bit more thought. Dr. Matthew Lipinski takes us through a few updates in the area beyond the routine basics. For other Grand Rounds Summaries please see our archives. There is a specific subset of cardiac syncope patients you should be aware of next time you pick up their ECG, and that is your chronic bifascicular block patients. First off: What do I mean when I say bifascicular block? 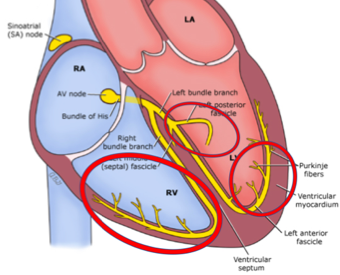 For this discussion, there are three different conduction pathways which can be interrupted after the AV node: the right bundle, the left anterior fascicle, and the left posterior fascicle. McAnulty et al prospectively enrolled 554 patients with chronic bifascicular or trifascicular blocks on ECG and then monitored them up to 42 months out. They found that progression to heart block was rare. Only 19 patients ended up having progression to heart block (this was averaged between symptomatic and asymptomatic patients). This works out to an incidence of about 1%/yr. They showed that patients who were randomized to a pacemaker with a backup rate of 60 bpm had significantly fewer syncope symptoms than those patients randomized to a pacemaker with a backup rate of 30 bpm, highlighting the benefits of pacemakers in this population. The B4 Study (Bradyarrhythmia in BBB) by Moya et al. in 2011 which mainly looked at the safety and efficacy of an outpatient approach to cardiac syncope in BBB. They showed that in those patients with persevered LV function, patients with cardiac syncope and bundle branch block could be safely investigated as outpatients with low mortality rates. In those patients with cardiac syncope who do not have risk factors for ventricular arrhythmia (Cardiomyopathy, prolonged QTc, CHF), they can be safely worked up and monitored in the community. 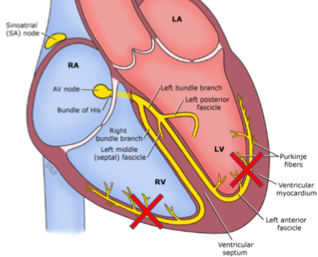 Ventricular Tachycardia originates at or below the bundle of His. Most the time, the etiology is ischemia-mediated with structural heart damage as the culprit. While many people believe that ventricular tachycardia is predominately an unstable arrhythmia, it often in fact is a stable, perfusing rhythm. The Expert Consensus on Ventricular Arrhythmias in 2014 states that non-sustained VT is found in 6% of patients being investigated for palpitations. The ACC/AHA/ESC 2006 guidelines for Management of Ventricular Arrhythmia promote Procainamide as a reasonable first choice in these patients. The European Society of Cardiology 2015 guidelines recommend Electrical Cardioversion as their first line treatment (but that Procainamide or Amiodarone are reasonable alternatives). There have been recent retrospective studies and systematic reviews that have tried to determine which medication, amiodarone or procainamide, is more effective in stable ventricular tachycardia. While they found no difference in the effect of either medication, the included study designs had their flaws. As such, most recently PROCAMIO was a prospective, randomized control trial which compared Procainamide vs. Amiodarone in stable, wide complex QRS, monomorphic tachycardia (presumed VT). 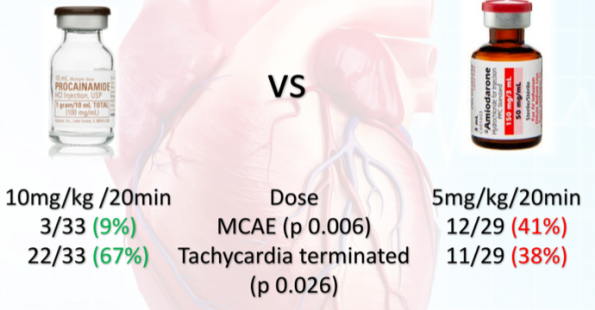 Using procainamide 10mg/kg IV infused over 20 mins, they found it had significantly fewer adverse events and significantly greater success rate of cardioversion than amiodarone 5mg/kg IV infused over 20 mins. “Recently” (2014) The Canadian Cardiology Society (CCS) updated their recommendations for anticoagulation in Atrial Fibrillation. In the 2016 update, this was renamed the “CHADS-65” and is the current recommendations for oral anticoagulant (OAC) initiation. The CCS also recommends Direct Oral Anticoagulants (ex. Apixaban, Rivaroxaban, Dabigatran) as the preferred initial treatment over Warfarin if not contraindicated. (Dr. Ian Stiell discusses the CHADS-65 score here). The first being that they found those aged 65-74 had an annual risk of stroke that was 2.1% (compared to HTN at 1.6%, which is a CHADS2 risk factor). The second rationale for more aggressive OAC prescribing was that most people who survive a major bleeding event, survive it well. This is compared to strokes that they found had a 70% chance of major disability or death. The HAS-BLED score by Lip et al. 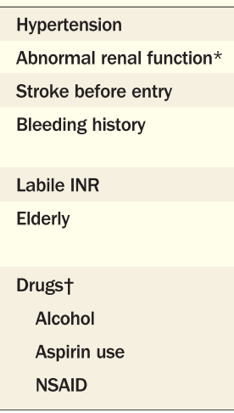 in 2011 can be used to try and identify patients at higher risk of bleeding. Criticisms of the score are that it is very conservative, including many patients as “high risk.” That being said, I think it is as good a place to start as any to try and risk stratify patients. Multiple studies have shown that we are not very good as Emergency Physicians at prescribing oral anticoagulants. There are many cognitive barriers to this, including concerns of increased bleeding risk and falls. We tend to overestimate the risk of bleeding and falls in these patients, while underestimating the benefit of anticoagulation. A mathematical model by Man-Son-Hing et al. in 1999 determined that a patient over the age of 65 years old would have to fall 295 times/year for the increased risk of Subdural Hemorrhage (SDH) while on Warfarin to outweigh the stroke benefit of Warfarin. With 1/10 falls having a risk of major injury, it’s the fall that will kill the patient, not the increased risk of SDH while on an anticoagulant. 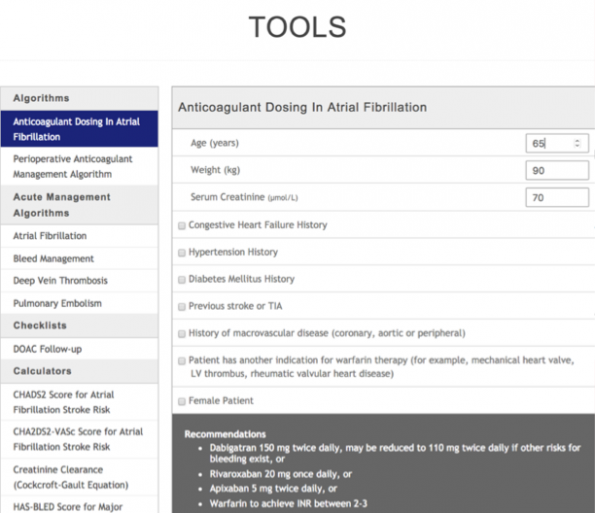 Use the Thrombosis Canada App/Website when initiating your patients on DOACs in the ED. H. MJ, H. RS, Edward M, et al. Natural History of High-Risk Bundle-Branch Block. N Engl J Med. 1982;307(3):137-143. doi:10.1056/NEJM198207153070301. Santini M, Castro A, Giada F, et al. Prevention of syncope through permanent cardiac pacing in patients with bifascicular block and syncope of unexplained origin: The PRESS study. Circ Arrhythmia Electrophysiol. 2013;6(1):101-107. doi:10.1161/CIRCEP.112.975102. Moya A, García-Civera R, Croci F, et al. 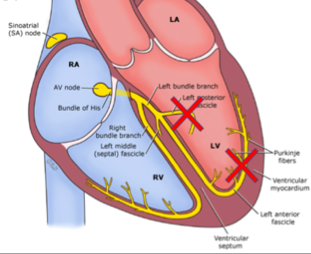 Diagnosis, management, and outcomes of patients with syncope and bundle branch block. Eur Heart J. 2011;32(12):1535-1541. doi:10.1093/eurheartj/ehr071. Peachey H, Pedersen CT, Kay GN, et al. EHRA/HRS/APHRS Expert Consensus on Ventricular Arrhythmias. Hear Rhythm. 2014;11(10):e166-e196. doi:10.1016/j.hrthm.2014.07.024. Zipes DP, Camm AJ, Borggrefe M, et al. ACC/AHA/ESC 2006 Guidelines for Management of Patients With Ventricular Arrhythmias and the Prevention of Sudden Cardiac Death–Executive Summary: A Report of the American College of Cardiology/American Heart Association Task Force and the European Societ. Vol 114.; 2006. doi:10.1161/CIRCULATIONAHA.106.178104. Priori SG, Blomström-Lundqvist C, Mazzanti A, et al. 2015 ESC Guidelines for the management of patients with ventricular arrhythmias and the prevention of sudden cardiac death – Addenda. Eur Heart J. 2015;36(41):2793-2867. doi:10.1093/eurheartj/ehv316. Marill KA, DeSouza IS, Nishijima DK, et al. Amiodarone or procainamide for the termination of sustained stable ventricular tachycardia: An historical multicenter comparison. Acad Emerg Med. 2010;17(3):297-306. doi:10.1111/j.1553-2712.2010.00680.x. deSouza IS, Martindale JL, Sinert R. Antidysrhythmic drug therapy for the termination of stable, monomorphic ventricular tachycardia: a systematic review. Emerg Med J. 2015;32(2):161-167. doi:10.1136/emermed-2013-202973. Ortiz M, Martín A, Arribas F, et al. Randomized comparison of intravenous procainamide vs. intravenous amiodarone for the acute treatment of tolerated wide QRS tachycardia: the PROCAMIO study. Eur Heart J. 2016;102((Suppl. 8)):I112-I128. doi:10.1093/eurheartj/ehw230. Macle L, Cairns J, Leblanc K, et al. 2016 Focused Update of the Canadian Cardiovascular Society Guidelines for the Management of Atrial Fibrillation. Can J Cardiol. 2016;32(10):1170-1185. doi:10.1016/j.cjca.2016.07.591. Verma A, Cairns JA, Mitchell LB, et al. 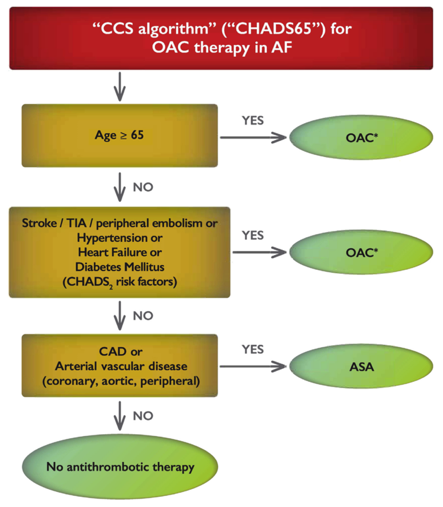 2014 focused update of the Canadian cardiovascular society guidelines for the management of atrial fibrillation. Can J Cardiol. 2014;30(10):1114-1130. doi:10.1016/j.cjca.2014.08.001. Lip GYH, Frison L, Halperin JL, Lane DA. Comparative validation of a novel risk score for predicting bleeding risk in anticoagulated patients with atrial fibrillation: The HAS-BLED (hypertension, abnormal renal/liver function, stroke, bleeding history or predisposition, labile INR, elderly, drug. J Am Coll Cardiol. 2011;57(2):173-180. doi:10.1016/j.jacc.2010.09.024. Stiell IG, Clement CM, Rowe BH, et al. Outcomes for Emergency Department Patients With Recent-Onset Atrial Fibrillation and Flutter Treated in Canadian Hospitals. Ann Emerg Med. 2017. doi:10.1016/j.annemergmed.2016.10.013. Scheuermeyer FX, Pourvali R, Rowe BH, et al. Emergency Department Patients With Atrial Fibrillation or Flutter&nbsp;and an Acute Underlying Medical Illness May Not Benefit&nbsp;From Attempts to Control Rate or Rhythm. Ann Emerg Med. 2015;65(5):511-522.e2. doi:10.1016/j.annemergmed.2014.09.012. Atzema CL, Austin PC, Chong AS, Dorian P, Jackevicius CA. The Long-Term Use of Warfarin among Atrial Fibrillation Patients Discharged from an Emergency Department with a Warfarin Prescription. Ann Emerg Med. 2015;66(4):347-354.e2. doi:10.1016/j.annemergmed.2015.03.024. Sen S, Dahlberg KW. Physician’s fear of anticoagulant therapy in nonvalvular atrial fibrillation. Am J Med Sci. 2014;348(6):513-521. doi:10.1097/MAJ.0000000000000349. Choudhry NK, Anderson GM, Laupacis A, Ross-Degnan D, Normand S-LT, Soumerai SB. Impact of adverse events on prescribing warfarin in patients with atrial fibrillation: matched pair analysis. BMJ. 2006;332(7534):141-145. doi:10.1136/bmj.38698.709572.55. Man-Son-Hing M, Nichol G, Lau a, Laupacis a. Choosing antithrombotic therapy for elderly patients with atrial fibrillation who are at risk for falls. Arch Intern Med. 1999;159(October):677-685. doi:10.1001/archinte.159.7.677.